You'll be £14.99 closer to your next £10.00 credit when you purchase Tank Wrecks of the Eastern Front 1941–1945. What's this? Four years of armoured battle on the Eastern Front in the Second World War littered the battlefields with the wrecks of destroyed and disabled tanks, and Anthony Tucker-Jones’s photographic history is a fascinating guide to them. It provides a graphic record of the various types of tank deployed by the Red Army and the Wehrmacht during the largest and most destructive confrontation between mechanized armies in military history. During the opening stages of the war the German victors regularly photographed and posed with destroyed Soviet armour. Operation Barbarossa left 17,000 smashed Soviet tanks in its wake, and the heavy and medium tanks such as the T-28, T-35, KV-1 and the T-34 proved to be a source of endless interest. Once the tide turned the wrecked and burnt-out panzers – the Mk IVs, Tigers and Panthers – were photographed by the victorious Red Army. As well as tracing the entire course of the war on the Eastern Front through the trail of broken armour, the photographs provide a wide-ranging visual archive of the tank types of the period that will appeal to everyone who is interested in tank warfare and to modellers and wargamers in particular. 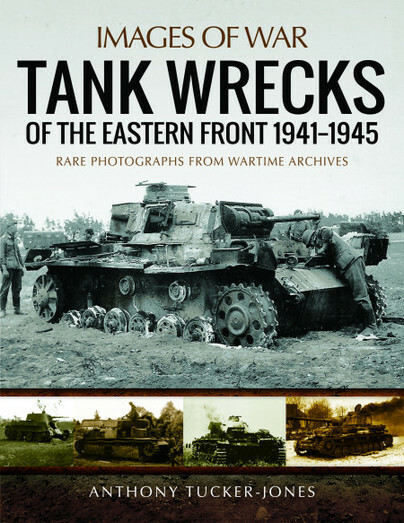 As well as tracing the entire course of the war on the Eastern Front through the trail of broken armor, the photos provide a wide-ranging vision archive of the tank types of the period that will appeal to everyone who is interested in tank warfare and to modelers and wargamers in particular. The sights and smells that the inquisitive solder must have encountered when attracted to examine these wrecks may well have made them glad to be infantrymen I suspect. A very good addition to the Images of War series and I continue to find these ones from Anthony Tucker-Jones a reliable reference. Anthony Tucker-Jones is a former defence intelligence officer and a widely published expert on regional conflicts, counter-terrorism and armoured and aerial warfare. He is the author of numerous books including Falaise: The Flawed Victory, Operation Dragoon: The Liberation of Southern France 1944, Armoured Warfare on the Eastern Front, Tiger I & Tiger II, T-34: The Red Army's Legendary Medium Tank, The Panther Tank: Hitler’s T-34 Killer, The Battle for Budapest 1944-1945 and The Panzer IV: Hitler’s Rock. For further information his website can be found at www.atuckerjones.com.